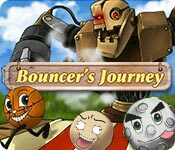 Bouncer's Journey is rated 3.3 out of 5 by 4. Rated 5 out of 5 by pennmom36 from Extremely Addicting Shooting Game! This is a really cool shooting game BUT apparently I have no skills because I never made it past round 6! Not only did I not beat level 6, I replayed the level over and over and will probably have to buy the game so I'll have enough time to sharpen my weak skills! 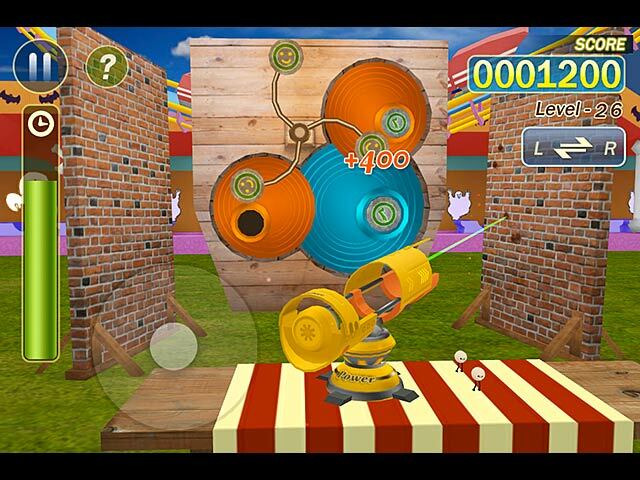 The object of the game is to shoot various sized balls into small holes, by shooting at an opposite wall so that the ball ricochets off one wall and hopefully into the holes on the other wall. 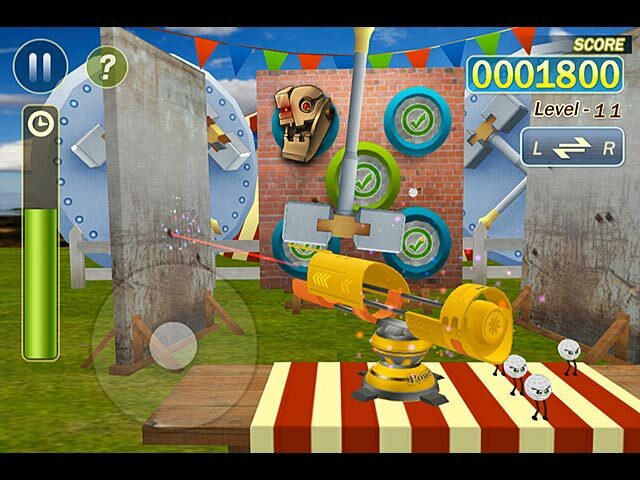 You get more points the faster you complete the level, and more points for shooting bigger balls into smaller holes. 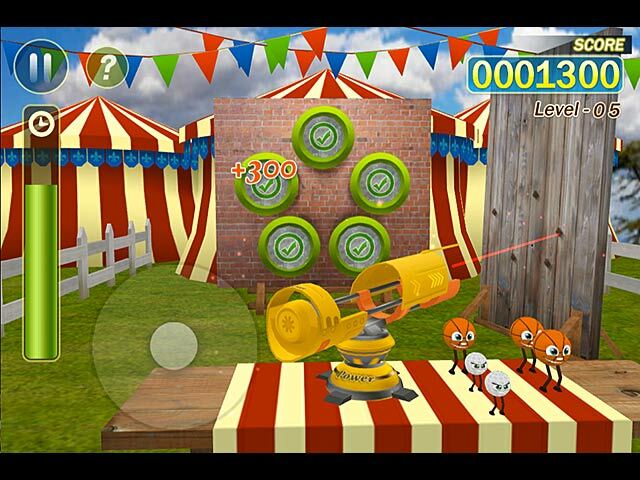 The first few levels show you exactly where you need to shoot the laser beam in order for the ball to go through the hole, after that you need to figure out by trial and error. Roboto the evil carnival owner will pop his head out of various holes which will block your shot so you need to time the shot just right. The goal is to get 3 stars on each level, you can replay the level as much as you want and there are bonus rounds between sets where you get a bunch of free-throws. There is an international leaderboard but I don't think I'll be on that list any time soon, enjoy! Rated 5 out of 5 by sfr8rfan from I Think the Bouncer was SIPPING!! I wanted a change of pace and this was it. What a fun, low-stress way to spend, wait...the time flew by, almost as fast as the balls. As you progress in the game so to do the levels of interesting targets, from the very basic "hole in the wall," to far more intricate designs ending up with multiple walls. Take aim and fire. If you play racquetball or handball, you can easily see the fun in this game. One complaint only: the music is absolutely the right tempo...very upbeat...but it's way too repetitive and the only alternative is to mute it. Aside from that minor complaint, I'd say, if this is your thing, then this is your game. Rated 2 out of 5 by agedbeauty from Bouncing Not Fun I couldn't even progress past the first set of basic levels. The individual ones are easy since they show you where to fire but the first 'bonus level' isn't a bonus unless you get ALL three balls through ALL three hoops. Without passing this 'bonus level' you can't go any further. Didn't enjoy this at all, just ended up frustrated.